You can easily display Microsoft Excel charts and tables using the Excel Web Access Web Part in Microsoft SharePoint 2013. This enables decision makers to quickly view real-time data without having to locate the Excel workbook and find the appropriate worksheet that contains the information. This step-by-step guide assumes the creator knows how to create charts and tables in Excel and has the knowledge to create a Wiki page in SharePoint. 1. Create an Excel workbook with charts and tables. Make sure to provide meaningful “names” for each chart and table in the Name Box on the left side of the formula bar. You will be referencing the chart or table names in the SharePoint Web Part. 2. 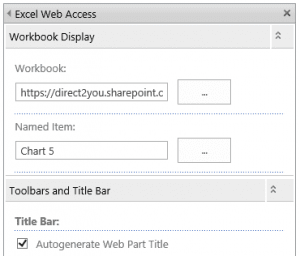 Upload the Excel workbook to a SharePoint Document Library. 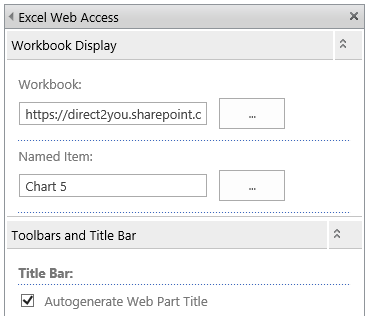 Since the Excel file is in a Document Library, users will have a collaborative space to open and edit the actual workbook file. 4. While in the Wiki page edit mode, place the cursor where you would like to insert a Web Part and from the Insert tab on the Ribbon, in the Parts group, click on Web Part. 5. Select Excel Web Access from the Parts group in the Business Data categories. Then click the Add button. 6. From the inserted Excel Web Access Web Part, click on the “Click here to open the tool pane” link. 7. From the Tool Pane in the Workbook Display group, click the browse button to reference the uploaded Excel workbook, then click the browse button to “type” in the Named Item (that was assigned in Excel) to display as the default. 8. When you Save and Close the page, you can easily view Excel dashboards. 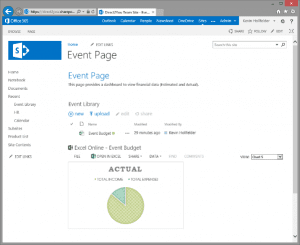 As the Excel workbook data changes, the Web Part will reflect changes in real-time. 9. You can select other Excel “Named” components from the View menu or simply create additional Web Parts to display other chosen Excel charts or tables. For more IT Training information visit www.directionstraining.com or call 1-855-575-8900. Hi, Do you know if it’s possible to auto-refresh the data connections in the excel file without it having to be opened by a user? I have one of these dashboards that displays data from a SharePoint list but in order to keep the charts up to date I must open the excel file and manually refresh all data connections regularly.